WASHINGTON—The GW School of Nursing will host a pinning ceremony on December 6 to mark the completion of its first Bachelor of Science class within the newly-established school. Seventeen students will take part in the ceremony, which begins at 6 p.m. in the GW Virginia Science and Technology Campus's Innovation Hall. Susan Hassmiller, Ph.D., R.N., F.A.A.N., Special Advisor on Nursing to the President of the Robert Wood Johnson Foundation, will be the guest speaker. 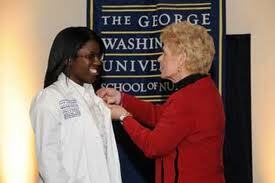 A pinning ceremony is a tradition in nursing to mark the completion of a program of study. Students will also plan on attending the official University commencement in May. Established in July 2010, the GW School of Nursing is composed of Master of Science in Nursing programs, a Doctor of Nursing program, a second degree Bachelor of Science in nursing, and other post-masters certificate programs. Many of these programs existed previously in the Department of Nursing Education within the GW School of Medicine and Health Sciences. All of the school's classroom exercises, including the simulation lab, are located at The GW Virginia Science and Technology Campus in Ashburn. WHEN: Monday, December 6, 6 p.m.
*Note: Music begins at 5:30 p.m. Refreshments follow the 1-hour ceremony.